I’m So Tired of My Acne! You have acne. And you’ve tried everything out there to treat it and failed. You’re frustrated, aggravated and almost to the point where you don’t even want to get up and look in the mirror every morning because you’re afraid of how much worse your acne will be. Sound familiar? If this is you and you’re sick and tired of being sick and tired of having acne, then we have some good news for you! At Celibre Medical, we offer the latest, advanced laser technology and medical grade skin care available to help you beat your acne once and for all. How can we promise you this? Because we’ve spent years developing comprehensive, unique and effective acne treatment programs for patients suffering with acne in the Los Angeles and Orange County areas. And we know they work, because we ask our patients if they’re happy! In fact, over 70% of Celibre patients say that they are happy with their results, and that’s a track record that we are not only proud of, but that we want to share with you if you’re wondering where to go to find help for your acne. Acne is one of the most emotional, frustrating and difficult skin conditions that a person can have. We understand this, and it has become our passion to help patients like you find real solutions for their acne. We do this by getting to know you, your acne, what you’ve done (and failed) in the past, your skin type and your treatment goals and then we develop an individualized, comprehensive treatment plan just for you that includes medical grade skin care, light and laser treatments, PDT (photodynamic therapy) and/or chemical peels that fits both your lifestyle and your budget. First of all, it’s important to understand that everyone (yes, everyone) has acne. Maybe, for some, it’s just a pimple here and there, but acne is a very natural part of having skin. So there’s nothing wrong with you and you’re not alone in having acne. That being said, there is definitely a spectrum of acne that exists, and someone who has more severe or widespread acne is more likely to seek out care to get rid of it. A single acne lesion starts when a hair follicle (and oil gland) becomes clogged with a mix of oil and dead skin cells. This blocks the pathway that oil usually takes to get out onto the skin’s surface, so more oil builds up in the blocked follicle. A normal skin bacteria, called P. acnes, starts to overgrow in this super-oily environment. And because this isn’t normal for our skin, the immune or “regulating” cells in our skin see it as a little “micro” infection and go into the follicle to get rid of it. This causes more inflammation, which you can see as a visible pimple of acne. When you add in hormones, which tell the oil glands to make even more oil, then the process just gets worse, and eventually, the oil gland itself actually enlarges (because it’s working so hard) and makes even more oil! Acne is an unfortunate, vicious cycle. But ingeniously, laser technology helps take advantage of this aspect of acne. Because the oil glands are larger, we can target them easier with a laser and shrink them, which makes acne so much better! But before we get into that, let’s briefly discuss the different types of acne and some common terms that you may hear when talking about your acne. Acne Vulgaris (moderate) – This is the proper, medical term for acne. The spectrum of acne vulgaris can run from mild, moderate to severe. The moderate form is what most people have. It can show up as a combination of whiteheads, blackheads, papules and pustules. Whiteheads: This is the term that describes a pore that is completely blocked. In a whitehead, sebum (oil), bacteria and dead skin cells are all trapped in the pore, which causes it to look like a white bump on the skin’s surface. Whiteheads will come and go quickly. Usually, they last only a few days. Blackheads: This term describes a partially blocked pore. There is still a mix of sebum (oil), bacteria and dead skin cells, but some of this material can get out onto the skin’s surface. This allows contact with the air; and because it also contains melanin (our natural pigment) it oxidizes, which makes it turn a dark brown or black looking color. Papules: This term describes the classic red, raised, tender bump of acne. It happens because of too much inflammation in the blocked follicle. After awhile, the follicle breaks down or ruptures which causes all of the mixture inside of it to have contact with the normal, healthy part of the skin, known as the dermis, around it. Papules don’t have a “head”, but they will often turn into a pustule. Pustules: These are papules on steroids. The inflammation in the follicle is so great that you actually see some of the pus, sebum and other breakdown products as a white or yellow bump sitting on the skin’s surface. There is often a lot of redness around the pustule too. They can be all sizes and they are ALWAYS a temptation to pick at or pop. It’s important that you really try not to do this, as it can just make your acne a lot worse. Acne Vulgaris (Severe): This type of acne can have all of the above lesions plus nodules and cysts too. It is not as common as moderate acne, but it has a higher risk of leaving behind traumatic scars. Nodules: These are deep, painful and large areas of inflammation in the skin. In nodules, the same process takes place as in papules, but it’s located really deep in the dermis. And when this happens, it usually spreads to the nearby neighbor follicles and involves them too. Nodules can last months sometimes, and if they don’t completely heal, they will leave behind something called an impaction, which will flare up over and over. Cysts: Cysts are very similar to nodules as they are large and deep areas of inflammation. The difference is that they will form a membrane around the ruptured follicle. They will hold in all of the pus and breakdown products of the inflammatory process. Then, they will start to move up towards the skin’s surface, which damages anything and everything in its path, including the rest of the follicle structure. Cysts can vary in size but are usually around the size of a pencil eraser or bigger. 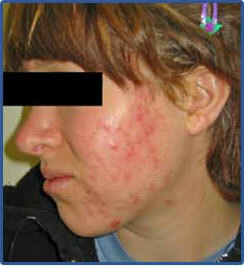 Acne Rosacea: This is another name for the skin eruption that occurs with Rosacea. The two skin problems actually tend to look a lot alike, and sometimes can be very hard to tell apart! Rosacea: This is a very common skin condition that affects adults over the age of 30. It causes redness in the face and along with that, sometimes there will be pimples, bumps and blemishes. Rosacea typically occurs on the cheeks, nose, forehead and chin areas only. Also, along with redness, there may be flushing and dilated blood vessels too. Rosacea is more common in women, but when men do have it, it tends to be a lot worse for them. If it isn’t treated properly, the long-term inflammation can cause permanent disfigurement of the skin on the nose, causing it look thick, bumpy and swollen. This is known as rhinophyma. Acne conglobata: This is a very severe and disfiguring type of cystic acne that involves a deep, inflammatory network of nodules that are all interconnected beneath the surface of the skin. It is extremely painful and is very difficult to treat. It not only affects the face, but also the chest, upper arms, back, the buttocks and thighs as well. It causes severe scarring and can last for many years despite aggressive treatment. 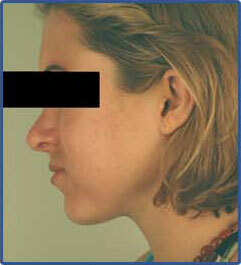 Acne Fulminans: This is a very sudden onset of acne conglobata that is usually seen in young men. In addition to all of the features described for acne conglobata, these acne lesions can also ulcerate or break open. There may also be fever and some joint pain and aching that comes on with the sudden acne outbreak. Acne fulminans leaves severe scars behind and can be really difficult to treat even with antibiotics. Gram-Negative Folliculitis: This is a type of bacterial infection that can look a lot like acne, and may even occur with acne that’s been treated for a long time with oral antibiotics. There are many pustules and cysts in this type of skin infection. It is pretty uncommon, but can affect both males and females. It is easy to treat with the right type of antibiotics, but the trick is in recognizing it. Once treated, it goes away quickly. Pyoderma Faciale (Rosacea Fulminans): This is another sudden, severe and painful form of acne that usually affects women between the ages of 20 and 40. Typically, the person has no previous history of acne, so pyoderma faciale is very scary as all of a sudden there are large nodules, pustules and sores on the face. And again, this type of deep and intense acne tends to leave behind significant scarring. Treatment can be difficult, but even if its not treated, it will usually only last about a year then calm down on its own. So, as you can see, there’s a lot more to acne than just pimples and zits. There are some pretty complicated and aggressive forms that require a lot of knowledge and expertise to both recognize and treat. Celibre Medical Corporation invests a lot of time and training in this process to ensure that you receive the best acne care possible. If you’ve been to multiple places, tried multiple medicines, maybe even Accutane, and you’re frustrated that you’re still breaking out all the time, please don’t wait another day. Give us a call and let one of Celibre’s acne experts meet with you and tailor a plan to get your acne under control fast. Our consultations are completely free and we are happy to see you at either of our convenient Los Angeles or Orange County offices.